It’s easy to make a simple soup that will impress your guest. Just a few steps and you’re done. Here’s how you can take your soup one step further with a super easy recipe for making homemade crackers. Now, I can’t take credit for this recipe but I will stay they are incredible. No more boxed crackers for me! P.S: These cuties make perfect gifts. Wrap them up and pair them with a gourmet soup mix. 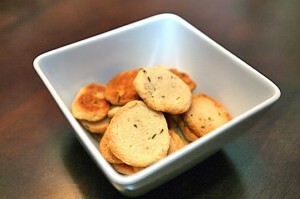 Or serve them during bbqs or holiday parties. In a small food processor, blend the goat cheese and butter together until smooth. Add the thyme and a pinch of salt and pepper. Blend to combine. Add the flour and blend until dough begins to stick together. Remove the dough and using a piece of plastic wrap to mold the dough into log. Chill for about an hour. Heat the oven to 325 degrees. Remove the dough log from the refrigerator and cut very thin discs – 1/3-inch. Spray a baking sheet with nonstick spray and place discs about an inch apart. Bake until golden on top about 30 minutes. Remove from the oven and place crackers on a cooling rack. Cool completely before eating.